Happy 2019! Hundreds of medical apps for healthcare providers and patients are bound to show up this year. We’re committed to picking the most useful ones for medical professionals as they come along. And don’t forget to see what we thought were the best medical apps in 2018. PushPrescriber is an app for obstetricians and delivery teams in any labor and delivery setting. It is a digital version of the study “Pushing the Bounds of Second Stage in Term Nulliparas with a Predictive Model: When Should You Abandon the Ambition of Spontaneous Vaginal Delivery?” (According to their website, this study has been submitted for publication.) Users first input patient information, such as fetal head position and length of the second stage of labor. A customized prediction is then generated that compares the likelihood of vaginal birth and necessary C-Section, as well as mother and child morbidity. 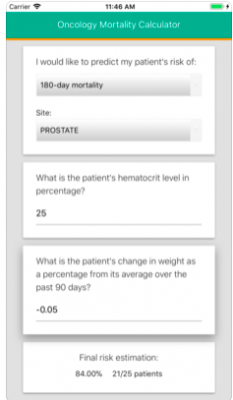 OncoMortality app’s algorithm is designed as a clinical decision support tool for care providers. It is based on “An Actionable Tool for Mortality Predictions in Cancer Patients,” which appeared in JCO Clinical Cancer Informatics in June of 2018. Medical providers can predict risk of 60-, 90-, and 180-day mortality for cancer patients. The algorithm currently includes breast, kidney, lung, ovarian, and other cancer types. 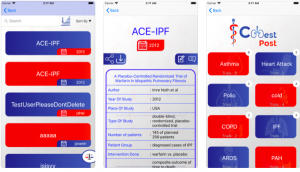 Chest Port provides up-to-date information on chest disease clinical trials on Apple devices. Current trials are classified by disease and available in PICO (patient, intervention, comparison, outcome) format for quick reference. Direct links and full citations are included to enable further learning and sharing. Landmark chest trials are also classified by disease and available within the app. Now on Android, the College of Optometrists provides its members with flexible access to core clinical guidance, even when it’s not connected to a network. Clinical management guidelines are logically organized and include up-to-date clinical images. An optometry-specific formulary is also built into the main menu. Users can add guidance, guidelines, and formulas to their favorites for easy access. Patient videos and clinical adviser contacts are also available.